A federal appeals court on Wednesday said that a Kentucky county clerk must issue marriage licenses to gay and lesbian couples. Kim Davis, the clerk of Rowan County, is among the handful of Kentucky clerks who are defying the Supreme Court's ruling striking down marriage bans in all 50 states. Following the high court's June ruling, Davis pledged never to issue a marriage license to a gay couple, saying it would be a violation of her Christian faith. Rather than serve gay couples, Davis stopped issuing marriage licenses to all couples. 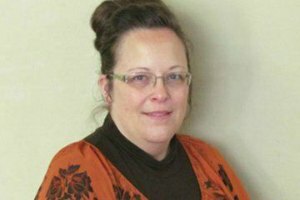 The American Civil Liberties Union (ACLU) of Kentucky filed a lawsuit against Davis on behalf of four couples, two of which are gay. After U.S. District Judge David L. Bunning ruled against Davis and ordered her to comply with the Supreme Court's decision, Davis, who is represented by the Christian conservative Liberty Counsel, turned to the Sixth Circuit Court of Appeals in Cincinnati, Ohio. In denying Davis' request for a stay pending her appeal, the court said that she was unlikely to prevail. Newsweek reported that Mat Staver, head of Liberty Counsel, planned to discuss options with Davis, including an appeal to the U.S. Supreme Court.